a group portrait of the six Gaffney sisters. mischief she was up to to pose for this portrait. Of the six Gaffney sisters of Conneaut, Ohio, Delia was the joker. There were several explanations for this. One story went that when Delia was a toddler, one of her sisters (no one would say who) was carrying her around in the field when she stumbled into a ditch and fell, dropping the baby. Delia’s back was injured, causing her to walk with a limp all her life. The other story was that she was deaf in one ear, a possible result of childhood scarlet fever. Due to one or both of these incidents, Delia, variously nicknamed “Di” and “Deal,” turned to humor as a way of deflecting attention from her physical challenges. She loved playing practical jokes on her family and many of the townspeople of Conneaut. She told colorful stories and had a wicked sense of humor that kept people wondering what she would be up to next. 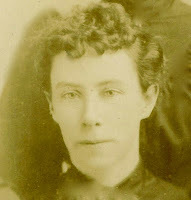 Di was born at home in Conneaut on June 23, 1864. She used to say she was born “during the dog days of summer.” She attended Conneaut High School as far as her freshman year. For reasons unknown, she seems to be the only one of the sisters who never held a job outside home throughout her life. One would think that as a single woman, she would have had to support herself. She, did, however, contribute a significant amount to the household by cooking and cleaning while her sisters worked. She also looked after their mother, Bridget (Quinn) Gaffney, when Bridget became too old to care for herself. She followed the same pattern her sisters had, living first in Conneaut and then moving to Cleveland, where all the sisters bought a house on Rocky River Drive. In October 1952, Di was diagnosed with uterine cancer. It progressed rather quickly over the next month, and she entered Longview Hospital in Kingsville, Ohio, in mid-November. She died there, two days after Thanksgiving. She was 88 years old. of my cousin, Suzanne, Benita’s granddaughter. 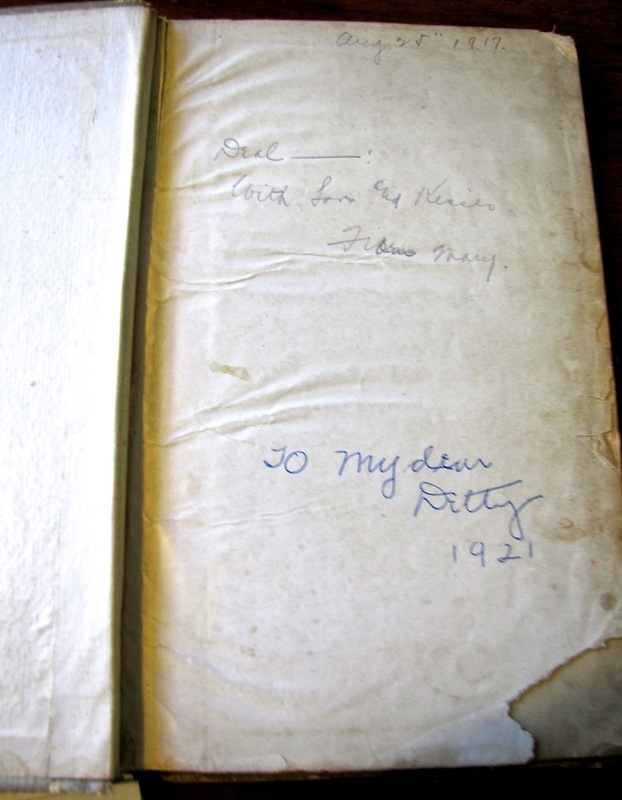 I would love to know who “Mary” was. She might have been Di’s eldest sister, Mary Jane Gaffney, or she could have been a friend. In 1921, Di gave the book to her niece, Benita “Detty” (McGinnis), as a wedding gift for her marriage to Phillip C. McCormick. Her own dedication is as simple as the one made to her a mere four years earlier. Wait – Millionaire Steak in a cookbook that encouraged thriftiness? Maybe it is not so odd. After all, as a Chicago millionaire once said to one of my ancestors, how do you think the rich get that way? Cook carrots, celery, peas, mushrooms, butter, ketchup, and Worcestershire sauce together in a sauce pan for 20 minutes. Pour vegetables and sauce over meat and bake in oven for ½ hour. Serves 6. Happy Blog Anniversary! May you have many more happy posts ahead! Joining the chorus of Happy Blogiversary to you! Thank you, Colleen! Looking forward to many more! Thanks for the Millionaire Steak recipe, Linda. Sounds yummy! I came across your blog while considering the Family Recipe Friday blog prompt for my own blog. Loved reading your posts. Your style is both entertaining and compelling. I'll be keeping up on your family stories. I' m glad you've enjoyed the recipe and the stories, Nancy. Your own blog is fascinating, too. Seems a lot of my reading has gravitated to Indiana lately – I have cousins living there now, though no ancestors I know of. Must be my Midwestern roots beckoning! Thanks for your kind words. Have a great week!